Delhi/Kolkata: West Bengal chief minister, Mamata Banerjee, is in a mood to mention the war. She is going hammer and tongs at Narendra Modi government. After her dharna, which she started on Sunday night, the Trinamool Congress (TMC) supremo has termed it as Satyagrah, which will continue till February 8. 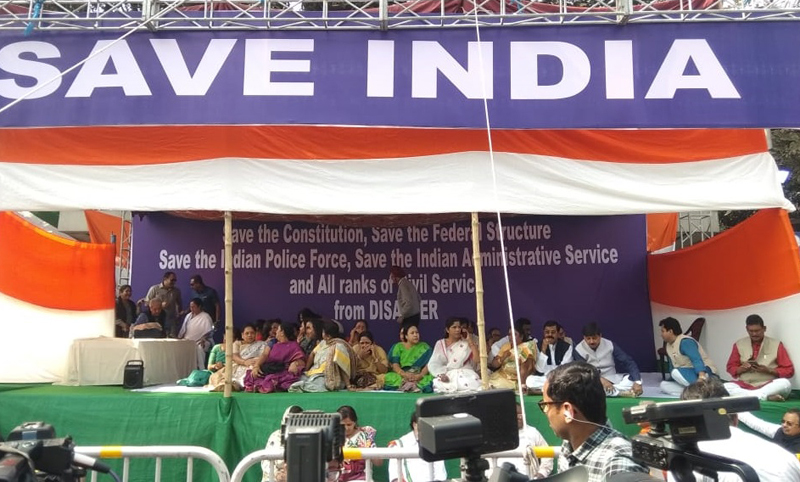 Yesterday evening when 40 CBI officials came to question the police commissioner of Kolkata, Rajeev Kumar in connection with the Sharda scam, little did they realize that they would have to face resistance and opposition from the state government and state police force. According to the CBI, Kumar allegedly suppressed evidence in the chit fund scams probe. We all know that Kumar headed the special investigation team on the Sharda and Rose Valley chit fund scam probes, and the CBI has alleged that he may have buried crucial evidence. However, all hell broke loose when it was found that the CBI officials had allegedly come without any warrant to question the commissioner. Mamata was incandescent with rage. She immediately declared that the CBI raid, which is the cause of the contretemps, was another attempt by the Modi-Amit Shah duo to intimidate and browbeat her government into submission. It is no secret that the West Bengal chief minister has remained a thorn in the flesh of the BJP for quite some time now for denying them foothold in the state. In a public rally a few days ago in the state, PM Modi made it clear that Mamata’s days as chief minister were numbered as people are disillusioned with her misrule. It is a different matter that for the chief minister, such criticism from even the likes of Modi is like water off a duck’s back. Moreover, the CBI offensive has emboldened her to take her fight to the ruling party, determined as she is, to call its bluff. The CBI’s attempt to drive the Trinamool government into a corner has backfired. Mamata, meanwhile, is back in her role as a street fighter. Having cut her teeth in the rough and tumble of politics in the eighties, the West Bengal chief minister is ready to batten down the hatches. She knows that politics may be about victimization and witch hunt; but it’s all just swings and roundabouts, because it can give one the advantage of sympathy and support. That is exactly what she has got from the opposition parties. Bengal chief minister has changed her dharna into Satyagrah against the CBI’s move and is planning to organise protests across the state today. The vociferous support of the opposition parties has strengthened the cause of the West Bengal chief minister who must feel happy at her growing political legitimacy and stature at the national level. Opposition leaders like Congress president Rahul Gandhi, Andhra Pradesh chief minister N. Chandrababu Naidu, Congress president Rahul Gandhi, Delhi chief minister Arvind Kejriwal, former prime minister and Janata Dal (Secular) leader H.D. Deve Gowda, National Conference leader Omar Abdullah, Rashtriya Janata Dal leader Tejashwi Yadav, Jharkhand Mukhti Morcha leader Hemant Soren and AIMIM’s Asaduddin Owaisi extended their support to Banerjee. Very shocking Modi/Shah duo will do anything to win the election, clearly Anityanath CM of UP has sent goons from UP/Bihar to threaten people in Kolkata. The saffron brigade is becoming active in Kolkata. Mamta should take strict action to thwart them off.